Shaw Trust Industries Doncaster is a social enterprise extruded plastics manufacturing facility run by Shaw Trust, a charity whose aim is to provide training and work opportunities for disabled and disadvantaged people. 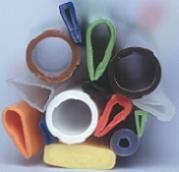 The factory and its people in South Yorkshire have many years experience in manufacturing plastic protective edging from low density polyethylene (LDPE) or polypropylene (PP) - both of which are kinder to the environment than PVC. All of the protective edging produced can be bought from stock in industry standard sizes, profiles and colours or manufactured to individual specifications. By buying from Shaw Trust Industries Doncaster you will be helping us to help many others who are disabed or disadvantaged in the workplace.